Additional research provided by Stephen C. Compton, Laura Hegyi, and Robert E. Ireland. See also: Blue Ridge Parkway; Good Roads Campaign; Highway Commission; Powell Bill; Roads. North Carolina's approximately 78,000 miles of paved highways represent one of the largest systems in the United States. Highways were initially a product of the popular Good Roads campaign of the early twentieth century. Roads across the state had improved little since colonial days and were among the nation's worst, encumbered with steep grades, blind curves, and many dangerous water crossings. Seasonably muddy or choked with dust, they often remained impassable for weeks. In red clay country, thin wagon wheels easily sliced the surface and potholes grew quickly into small ponds. The system of repair and maintenance was little changed from ancient times: under the "road-tax," as it was called locally, land-owning neighbors were obligated for a certain number of days of work per year cutting ditches and filling holes under the eye of a titular boss, usually another neighbor. This was seldom more than a social occasion, and the roadwork achieved was far from scientific. Cecil Kenneth Brown: The State Highway System of North Carolina: Its Evolution and Present Status (1931). John Harden, North Carolina's Highways and Their Builders, vol. 2 (1966). Tom Lewis, Divided Highways: Building the Interstate Highways, Transforming American Life (1997). "The Good Roads movement." North Carolina in the early 20th century. LearnNC.org. http://www.learnnc.org/lp/editions/nchist-newcentury/4971. North Carolina Good Roads Association. The development of a state policy in road building in North Carolina. Chapel Hill: North Carolina Good Roads Association, 1921. http://archive.org/details/developmentofsta00nort. Preston, Howard Lawrence. Dirt Roads to Dixie: Accessibility and Modernization in the South, 1885-1935. Knoxville: University of Tennessee Press, 1991. Search Results for Search results for Highways > North Carolina. Division of Highways. Statewide Planning Branch. North Carolina Digital Collections, Department of Cultural Resources. Search Results for Search results for Highways > n.c. Division of Highways, Dept. of Transportation. North Carolina Digital Collections, Department of Cultural Resources. 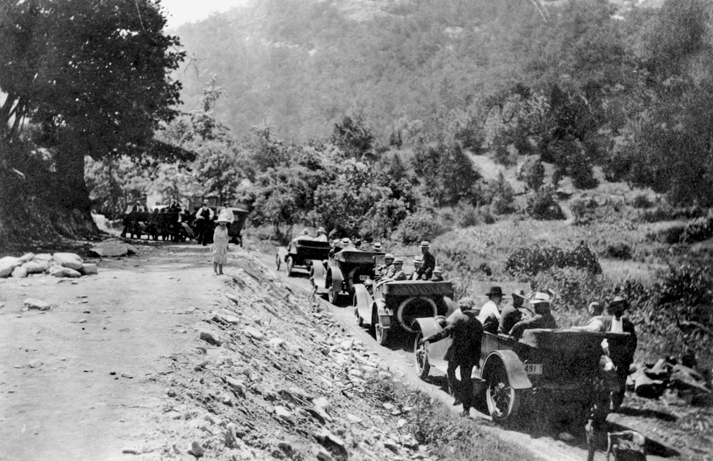 Automobiles, thought to be part of a caravan organized to illustrate the need for better roads, pause at Hickory Nut Gap near Asheville, 1916. North Carolina Collection, University of North Carolina at Chapel Hill Library.